An Inverness couple built an all-season farmhouse using their favorite Barrington stores and artists for its interior design. 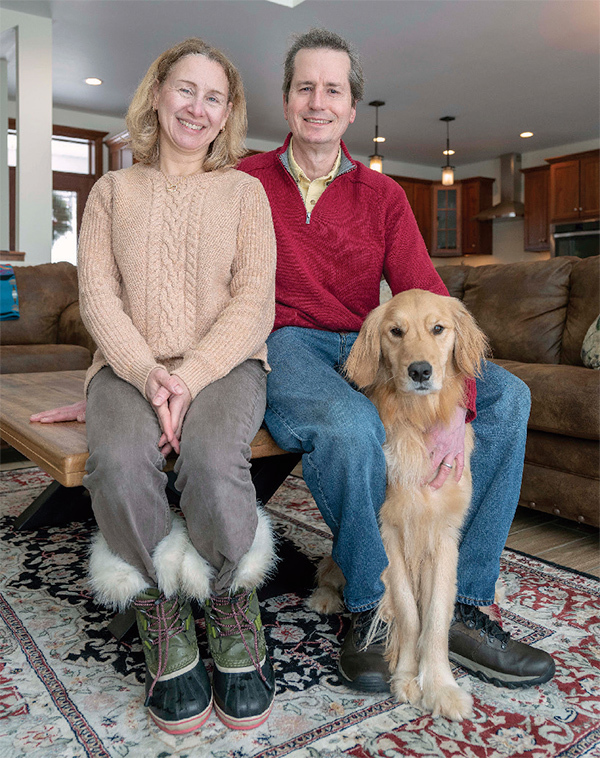 Wisconsin farmhouse owners Mary and Bill Sneed and their dog, Summer. The Driftless Area of the Midwest covers portions of Minnesota, Wisconsin, and small corners of Illinois and Iowa. Ignored by glaciers, this area was left hilly, dotted with patches of acreage that are suitable for farming. The land is farmed by the descendants of those who first settled here, by the Amish who adopted the area, as well as by a new breed of organic farmer. It is here, near Blue River, Wisconsin, that Inverness residents Mary and Bill Sneed bought land and built a second home. While not a true farmhouse style of architecture, it qualifies to them as a “farmhouse” since 80 acres of their land is tillable and farmed by an adjacent neighbor. Corn and soy are grown in rotation. Bill has even started to grow some of his own crops—hops to brew beer, planted out in the vast backyard. 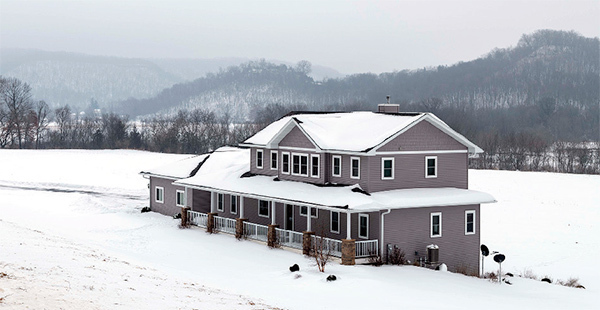 The Sneed’s recently-built Wisconsin farmhouse is in the southwestern region of the Midwest’s Driftless Area. Never touched by glaciers, the land here is characterized bybeautifully sculpted topography and an abundance of wildlife. Set atop a hillside in the middle of 160 acres, it’s the ideal getaway place for rest or recreation. A poster of the cast members of the TV sitcom “Green Acres” is prominently displayed in the lower level rec room, reminiscent of the show’s main character—a big city lawyer who bought a farm—as did Bill, who is an attorney at a law firm in Chicago. Like the show’s couple, country life is a big change for the Sneeds. Bill started hunting after college and pursues pheasant and deer in the country. Mary loves to cook and uses her game-friendly cookbooks to help her make dinner. One of her favorites to make is pheasant pot pie. The children, Thomas and Natalie, stick with basics like mac and cheese for dinner. The home was built on land that was owned by a man from Bill’s hometown of Deerfield, who lives up the hill in his original house. The couple hired an architect from Middleton, Wisconsin, whom they met at a Schaumburg lake and cabin show. 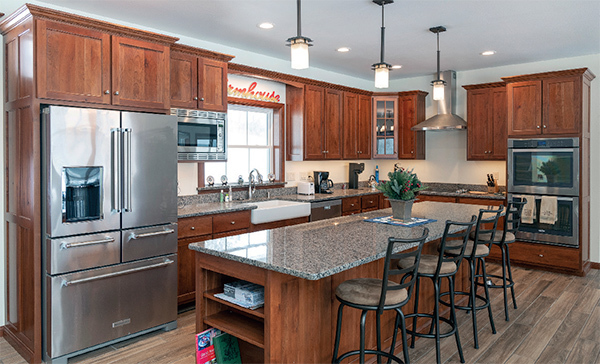 The builder, a family whose name is Kinney, included local Amish cabinet makers for the project’s woodworking needs. “We were unable to use our phone or email to reach our Amish cabinet-maker,” Mary said. “We had to trek up there and visit him in person.” There was no technology used in designing the cabinets. “All they used was a mechanical pencil, floppy ruler, and some graph paper.” Yet the cherry cabinets with a distressed finish are nearly flawless. created family portraits that grace the walls. Time is spent relaxing, riding bikes, and visiting art fairs when the family is in the country. There’s a large rec room on the lower level for the kids to play ping pong and board games. Best of all, the remote, rugged terrain offers a great escape, a place to smooth the edges of a busy life. 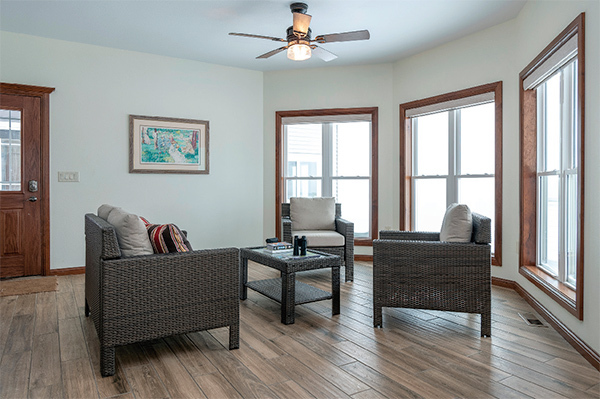 Outdoor furniture creates a seating area inside during the winter months. In summer, the porch wraps across the entire length of the house on the second of three floors.